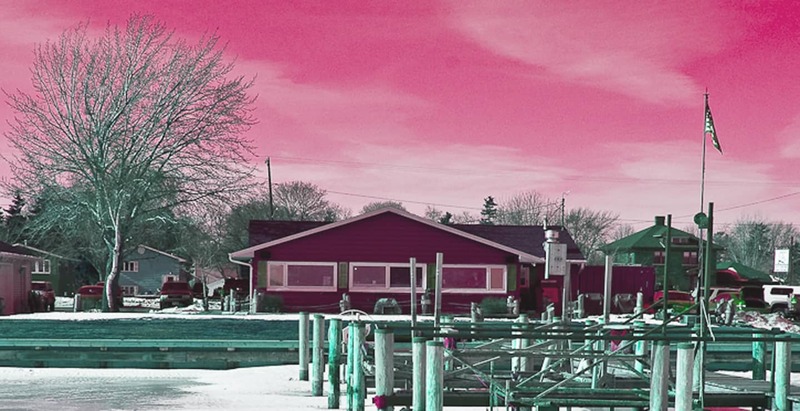 Outside the windows of the South Side Ice Yacht Club, the Skeeters, Renegades and Nites were effortlessly gliding over the dark gray ice sheet. Suddenly, sailing into view came a chilling blast from the past. A huge stern-steerer, its yellow stained, canvas sails straining against the twenty mile per hour wind. Behind its sheer size, the Skeeters, Renegades and Nites disappeared for seconds at a time before appearing again on the other side. Two, no three burly men steered and cranked and pulled, trying to tame the unruly beast. Moving in a southerly direction, its left (port? starboard?) runner gently lifts off the ice, a few feet at first, and then quickly shoots skyward. The runner plank is at an impossible angle to the ice. Surely the beast is going to capsize, but no, the three burly men continue to steer and crank and pull and the ice yacht slowly regains a more proper stance on the frozen surface. A slight change in direction to take advantage of a felt, but unseen wind shift, and the beast sailed away from view. “Arghh… that thar be the ‘Ice Soar’,” came a grizzled voice from behind. Eye sore? Ice Whore? What? I wondered. What the hell, I thought, I had time. The day’s racing had finished early in the breezy conditions. Besides, at a buck a bottle a guy could afford to invest a little in a good story. The old man started laughing so hard that beer was snortin’ out of his nose. After a few seconds he regained his composure and continued his story. ‘What’s a fella need to do to get a drink around here anyhow?” Catching the subtle hint, I head to the bar, returning shortly with a couple of cold ones. After a long swig of his beer, he continued his story. “Hoisting those massive sails in the seventy mile per hour wind was probably the hardest work any of those boys had ever done. Yet, somehow they manage. Wainwright, he puts the little girl in the basket next to him. Two others jump in the basket on the other side of ‘Ice Soar’s’ back-bone, one to handle the main, the other the jib”. The patrons of the bar instantly quit talking, the bartender stares icily at me. “What do you know about the ‘Ice Soar’?” he demands. All eyes are on me. The room is silent. “The ‘Ice Soar’, you know, that old stern-steerer that I saw sailing out on the lake today. That old guy back at the table, the guy I’ve been feeding beer all afternoon, was telling me the story.” I reply. I turned to look back at the table we were sitting at. No one was there. Just a tabletop of empty beer bottles. 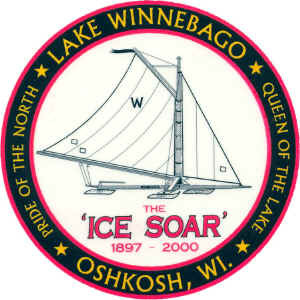 The bartender leaned in close, “We don’t much talk about the ‘Ice Soar’ around here fella. That evil boat and her crew of pirates was lost in the storm of 1938.” “But I saw it out on the…” I started. “I told you, that boat was lost in ’38. That’s all you, or anyone, needs to know about the ‘Ice Soar’. Don’t bring up its name again.” With that I gave my two bottles of Bud to a couple guys sitting at the bar and turned to leave the clubhouse. On my way out I passed a large, framed, picture of the ‘A’ boat, ‘Debutante’, hanging on the wall. I had looked over the old black and white image before, but this time, something caught my eye. In the background of the grainy photo there was another iceboat. If you looked closely you could just barely make out the name of that boat. The ‘Agnes Lenore’. I put my coat on and left.